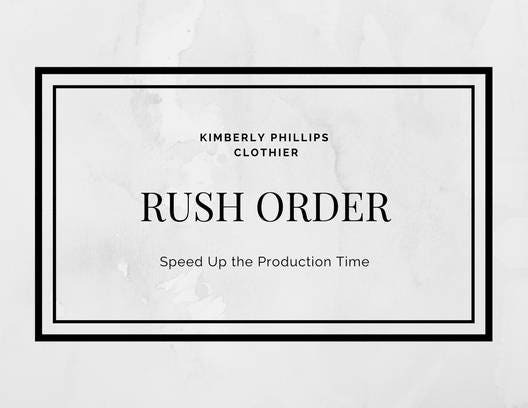 If you are last minute kind of person and don't have time to wait the full processing time, select the Faster Option to get your dress shipped in 2-3 weeks. Select the Even Faster option to get your dress shipped out in 1-2 weeks! Keep in mind that this quickens the PROCESSING time only, you may need to purchase a faster shipping option as well. I can only insure that I can get it shipped out on a certain day, I can not guarantee when the post will put it on your door step. Contact me before ordering to insure that I have the fabric for your dress in-stock, can get it completed in time, and to ensure that I can get it in the mail to give the post the proper amount of time to work their magic. Not available on Custom Orders.